In much the same way you crave a greasy, semi-toxic breakfast sandwich when you wake up hungover, you can't help but want to treat yourself by way of consumerism after inhaling three pumpkin pies and a vat of gravy on Thanksgiving. Fortunately, Black Friday is the occasion created precisely to justify your doing just that. 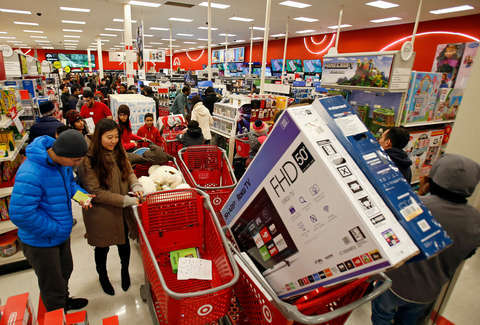 That said, there are few more volatile holidays in the world of retail. Black Friday shopping is not for the faint of heart. But lucky for you, we can help. This year, before changing into a full suit of armor to tackle your local Target location in pursuit of kitchen appliances, tech gadgets, and home goods, take a look at our roundup of the best deals all across the market, and B-line for the stuff you actually want. This year's deals are the best the place has offered to date. When Does Target Open on Black Friday? Because Black Friday never truly limits itself to the actual friday, all Target stores will open at 5pm on Thanksgiving Day, and stay open until 1am. Doors will open up again at 7am on Friday, November 23, and remain open until 1 am, once again. This way, you can buy a sleeping bag on Thanksgiving, then sleep right next to the store in order to secure your spot the following morning. And better yet, Target recently introduced a new mobile checkout program nationwide. This means that Target team members stationed throughout the store (they'll be dressed in red, we assume) can check you out via specialty handheld devices, and you'll never need to approach the monstrous line snaking through the front of the store. They'll get you in and out with some sense of efficiency -- we know you've got more shopping to do. Looking for more Black Friday deals? Check out the best sales at Walmart and GameStop as well as these cheap flight and TV deals. Hungry from all the shopping? Don’t miss all the great free food and pizza deals running all day.